The poker tournament is open to everyone over the age of 18. It is a traditional Texas Hold‘Em-style Poker Tournament. Food & Drink: There will be an open food bar at the event. There will also be a cash bar. 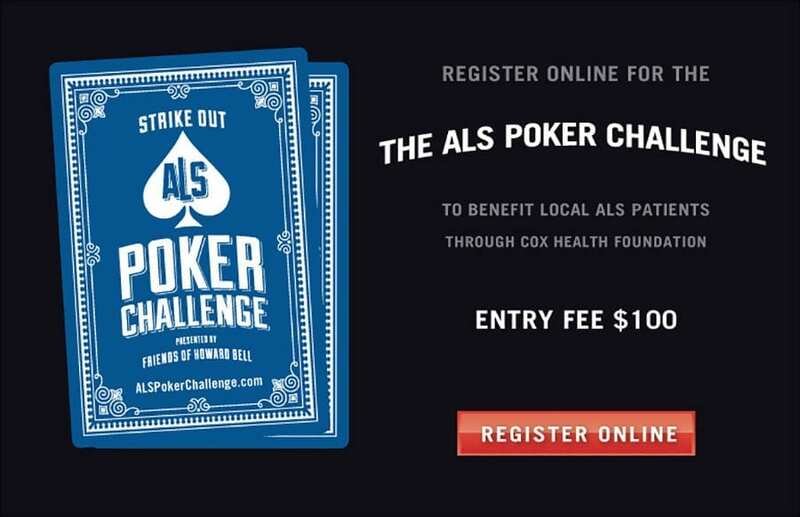 Prizes: The ALS Poker Challenge pays cash prizes to the top 10 winning places. Bonus Chip: A Bonus Poker Chip will be sold on site for $20. Rebuys: If a player is eliminated in the first 60-90 minutes, they can buy back into the game. Please contact Troy Kennedy at tkennedy@itifinancialmgt.com with questions or to become a sponsor. All proceeds benefit local ALS patients through the Cox Health Foundation.